Testata valvolare HT-5RH. 2 canali (Clean e Overdrive). Reverb stereo. Comando ISF (Infinite Shape Feature). 5 W di potenza. 2 valvole nel preamplificatore (1 x ECC83, 1 x 12BH7). Uscita di emulazione di altoparlante. TESTATA VALVOLARE 5 WATT CON RIVERBERO. Testata Valvolare per Chitarra da 5W con Riverbero. Loop Effetti: Si, con Effect Level Switch 4dBV/-10dBV. Uscite: Speaker Out (1x16 Ohm - 1x8 Ohm / 2x16 Ohm) – Speaker Emulated Out con switch 4x12" /1x12". Ilcombo valvolare per chitarra elettrica Blackstar HT-5R mantiene le stesse caratteristiche e lo stesso tono dell'HT-5C, ma aggiunge lo stesso riverbero stereo utilizzato nell'acclamata serie HT Venue. AMPLIFICATORE VALVOLARE PER CHITARRA 1x12" 5W. Uscita con emulazione speaker 1x12" o 4x12". Valvole: 1xECC83 e 1x12BH7. Infinite Shape Feature (ISF). Amplificatore valvolare in formato combo HT-5C. 2 canali (Clean e Overdrive). Reverb stereo. Comando ISF (Infinite Shape Feature). 5 W di potenza. 2 valvole nel preamplificatore (1 x ECC83, 1 x 12BH7). AMPLIFICATORE PER CHITARRA ELETTRICA BLACKSTAR HT-5R COMBO 2 CANALI CON REVERBERO STEREO. Amplificatore valvolare in formato combo HT-5C. Reverb stereo. 2 canali (Clean e Overdrive). Ingresso ausiliare per Cd o Mp3. Amplificatore valvolare chitarra Blackstar HT5R . Solo ritiro in zona. BLACKSTAR - HT-5R MKII - Combo à lampes 5W 2 canaux 2 voicing 1x12". BLACKSTAR - HT-5R MKII - Studio and practice amp. Voice 1 « Classic » - C’est l’overdrive classique type British Blackstar. Les plus beaux sons cleans : deux sonorités sont commutables, l’une avec un caractère américain et l’autre avec le son « British » class A – les deux sont 100% Blackstar . Verstärkertyp: Röhrenverstärker. Zubehör inkl. : Fußschalter FS-4. Taschen / Cases. BLACKSTAR HT-5R. Effekte: Digital Reverb. Bass, Middle, Treble, ISF, Reverb. Serie: HT-5. KEYS & PIANOKeyboards - Zubehör. Bauart: Vollröhre. - Leistung: 5 Watt. - Ausgang für Zusatzlautsprecher: Ja. - Impedanz: 8/16 Ohm. Dual-Triode Röhre. - Gewicht 12,3 kg. - Speaker-Emulation (1x 12" oder 4x 12"). - 2 schaltbare Kanäle clean/Overdrive. PERMUTIAMO IL TUO USATO ANCHE A DISTANZA! TESTATA VALVOLARE 5 WATT CON RIVERBERO. Testata Valvolare per Chitarra da 5W con Riverbero. Prodotto usato in perfette condizioni, con Footswitch ed imballo originale. Blackstar HT 5R Bronco Tan Limited Edition BLOW OUT SALE! New in Box! Buy a Blackstar HT5R! Blackstar HT-5R. Through an exclusive deal with Blackstar amplification. Complete Warranty From Blackstar. 12" 50 Watt speaker custom designed by Blackstar. Speaker Model 12" Custom Designed by Blackstar. Blackstar HT-5R Head Blonde NEW in BOX! Buy a Blackstar HT5R. Blackstar HT-5R Head Blonde ! Through an exclusive deal with Blackstar amplification. Complete Warranty From Blackstar. HT 5R Head They are no longer in production and once they are gone they will no longer be available. The Blackstar HT-5R MkII Combo is the updated version of Blackstar’s original groundbreaking 5 watt valve amp. Now better than ever, the HT5R MkII has improved, studio-quality reverb, USB and XLR out for pro recording and live performance, and footswitchable voices for the clean and overdriven channels. Black star HT-5th 5th Anniversary 2 x 10" Combo. Limited Edition of 2500. 5 Watt tube combo, 1xECC83 and 1x12BH7 valves. Foot switchable clean and overdrive channels. Digital reverb. Speaker emulated output with 1x12 or 4x12 voicing. The latest version of the Blackstar HT-5 Head with built in Digital Reverb. Specifications - Blackstar HT-5RH. Digital Stereo Reverb. Award winning HT Pedal preamp. Fully equipped for studio or practice. Buy a Blackstar HT1R. Through an exclusive deal with Blackstar amplification. Complete Warranty From Blackstar. And what's a great head without a speaker cabinet to match?. That role is filled beautifully with the portable powerhouse HT-112 1x12 cab, loaded with a single 12-in. Has been tested and works! Award winning HT Pedal preamp. Unique push pull power amp design. 1xECC83 and 1x12BH7 valves. GAK Saving: % OFF. RRP £ 0.00. Code: 917803. All Categories. Amplifiers > Guitar Amplifiers > Amp Heads. For your consideration is a used Blackstar HT-5R Limited Edition all tube head in blonde Tolex. This is a floor demo model head. This is the Blackstar HT-5R MKII Electric Guitar Tube Amplifier. The Blackstar HT-5R is quite simply the ideal amp for achieving and recording huge amp tones without blowing out the windows. We are an authorized Blackstar dealer. 12" 50W speaker custom designed by Blackstar. Award winning HT Pedal preamp. combo amplifier. Unique push pull power amp design. Effects loop with effects level switch. Two footswitchable channels. It allows you to choose the exact tone signature you prefer. This no-compromise design makes it easy to get your tone to disk and tape. Award winning HT Pedal preamp. Unique push pull power amp design. Including 2 1x12 cabs for the ultimate micro stack! Award winning HT Pedal preamp. Two footswitchable channels. Unique push pull power amp design. 1xECC83 and 1x12BH7 valves. GAK Saving: % OFF. RRP £ 0.00. Digital Stereo Reverb. Award winning HT Pedal preamp. 5 watt, 1xECC83, 1x12BH7. HT-5R Combo Features Overview. The HT-5R features two footswitchable channels to allow you to switch between the Clean channel and the Overdrive channel. Blackstar HT5-R 5W 1x12" Valve Combo Amplifier with Reverb. 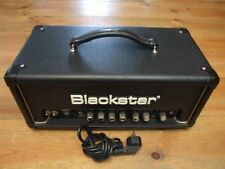 Blackstar HT-5R Head Japan new . The plug type in Japan is type A. If a conversion adapter can handle the electric power, all you need to do to use the product in your country is to change the plug to type A. All Japanese electric machineries operate at 95V-105 V (50Hz-60 Hz). Award-winning HT Pedal preamp. Unique push-pull power amp design. Depth:9.33". Width:17.48". Height 15.75". Footswitch included. Effects loop with effects level switch. Speaker emulated output with 1x12 or 4x12 voicing. · Digital stereo reverb. · 12" Blackbird 50 custom-designed speaker. 5 Watt, 1 x ECC83, 1 x 12BH7. · Speaker emulated output with 1x12 and 4x12 voicings. 20% or less down right away! Blackstar ht5 im super Zustand. 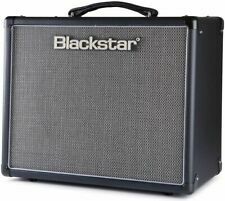 Blackstar HT-1R 1 watt Guitar Combo Amp. Condition is Used. Good condition, normal signs of wear. The 1/4" aux input jack needs to be replaced to be used. Guitar input and emulated output jacks work fine. From Hiroshima, Far east island Japan! If you need ASAP! FREE Trial! From Hiroshima, Far east island Japan! If you need ASAP! 12AX7/ECC83 preamp and 12BH7 power amp. 12BH7 (1) - USA. Depending on the style of music you play we have a tube set that will fit your needs. If you need genuine parts from the manufacturer of your amplifier, check for authorized dealers and distributors via the manufacturer’s website.